A large area of modern Pembrokeshire comprising the whole of Mynydd Preseli itself. It lay within the medieval Cantref Cemaes which was brought under Anglo-Norman control, in c.1100, by the Fitzmartins who retained it, as the Barony of Cemaes, until 1326 when they were succeeded by the Audleys. The Barony was conterminous with the later Hundred of Cemais, which was created in 1536, but many feudal rights and obligations persisted, some until as late as 1922. The character area includes the unenclosed portion of Mynydd Preseli, which consists of high moorland with craggy outcrops. The earlier significance of the area as a landscape is confirmed by the concentration of bronze age funerary and ritual features. The western end of the Mynydd Preseli character area is dominated by the round barrow on the summit of Foel Eryr, and the east end by the barrows (and later hillfort) on Y Foel Drygarn. The area was also the source of the bluestones of Stonehenge. A portion around Carn Afr, at the southern end of the area, belonged to the mesne lordship (or manor) of Maenclochog during the medieval period, held from the Barony of Cemaes by the Roche lords of Llangwm in the 13th- and 14th- century, and assessed at one knight's fee. Otherwise, the character area more-or-less corresponds with the great common of Mynydd Preseli, on which the freeholders of Cemaes had been granted rights of pasture and turbary by a charter of Nicholas Fitzmartin in the late 13th-century, as defined in a survey of 1594. This gives the boundaries as 'the Flemings' Way and Windypete (Bwlch-gwynt) indirectly eastwards to Blaen banon (in Mynachlog-ddu character area) and thus descending.... as far as Whitchurch (Eglwyswen), Meline.... and Cilgwyn'. The 'Flemings' Way' (or ' Via Flandrensica') of this and earlier documents is a pronounced earthwork that has been regarded as a prehistoric track. The 1594 survey makes it clear that 'the (common) was never improved by the lord as yet', and it is unenclosed today. However, a deer park may be recorded in the name Cnwc yr Hydd in the north of the area, while past settlement, and some enclosure, is demonstrated by the 13 deserted rural settlement sites identified within the area during a recent survey. A range of site types were identified, including longhuts and longhouses of unknown date, some associated with the remains of boundaries, and 18th- or 19th-century hafod sites which were used by freeholders during the summer pasture of sheep and cattle. There appears to be no evidence of rabbit farming. The common has been crossed by the main Haverfordwest-Cardigan route since the medieval period, and on its boundary with enclosed land to the north lies Tafarn-y-bwlch, which must have already been an inn in 1729 when it was marked, and labelled as so on Emanuel Bowen's map. The road was later turnpiked and is now the B4329. Mynydd Preseli historic landscape character area consists of all the unenclosed land of the Preseli Mountains ranging from a high point of 468m down to large tracts of boggy ground on the north side of the area at about 120m. 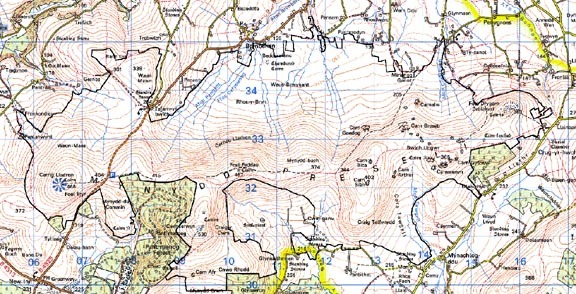 Essentially, Mynydd Preseli is an east-west aligned ridge reaching its highest point at Foel Eryr at its western end, and 363m at Y Foel Drygarn at its eastern end. Enclosed farmland on the more exposed north- and northwest-facing slopes gives way to the open moorland of this area at between 120m and 200m, but in the lee of the mountain on south- and southeastern-facing slopes fields and farms are present up to 300m. The overall landscape is one of open heath and bracken-covered moorland grazed by sheep. Hill slopes are rarely very steep, and the characteristic cliff and scree-slopes of other Welsh Mountain massifs are absent. However, summit and slope doleritic tor-like rock outcrops are a very distinctive natural element of the Mynydd Preseli landscape. These are particularly prominent at Carn Menyn, where a spiky ridge formed by them dominates the skyline. Preseli bluestone used in the construction of Stonehenge and in the manufacture of neolithic axes outcrops at Carn Menyn and Carn Alw. The significance of this landscape to prehistoric peoples is the subject of much debate in the archaeological world. Mynydd Preseli is not an inhabited landscape, though pockets of abandoned fields, farms and cottages on its fringes attest to recent - 19th century - depopulation, while more ancient settlements testify to a more intensively used landscape. The iron age hillforts of Y Foel Drygarn and Carn Alw are by far the most prominent and obvious settlements of this landscape, but the remains of a fairly dense scatter of more isolated dwellings across the open moorland demonstrate an intensive use of the landscape in the past. On occasions this may have been transhumance, but low, rubble boundary banks of long-abandoned fields attest to permanent agricultural holdings. Prehistoric burial cairns on summits are also a prominent aspect of this landscape. There are remains of small- to medium-sized quarries on the southern slopes. Apart from footpaths, transport elements of the landscape are limited to the B4329 which runs south-north across the mountains and the ancient east-west ridge-route called the Flemings' Way, now reduced to a tourist path. Recorded archaeology is mainly from the prehistoric and post-medieval periods. It is dominated by prehistoric ritual features, of which there is a very high density. They comprise a scheduled neolithic chambered tomb and a scheduled possible neolithic stone circle on Waun Mawn, another possible chambered tomb and neolithic finds. The scheduled bronze age round barrow on Foel Eryr dominates the western end of the area near a possible stone pair, and there is another scheduled barrow close by. There are also a group of scheduled round barrows on Foel Cwm Cerwyn, a group of three scheduled barrows on the summit of Y Foel Drygarn which dominates the eastern end of the area, another four round barrows and two possible barrows, and a ring barrow. There is a bronze age scheduled standing stone and two possible standing stones, and a scheduled stone pair. The prehistoric open settlement on Banc Llwydlos is scheduled. There is also prehistoric open settlement on Foel Eryr and Waun Mawn, on Carn Afr, Carn Alw and Carn Goedog where there are a number of other prehistoric sites of unknown nature but possibly include a ring barrow. Another group of prehistoric sites on Carn Menyn/Carn Gyfrwy are also of unknown nature but include an axe factory. A scheduled iron age hillfort occupies Y Foel Drygarn. The medieval period is represented by a possible medieval cross site, a watermill and wells. Other settlement is post-medieval, consisting of thirteen deserted rural settlement (DRS) sites including a longhouse, a platform, a shepherd's shelter, a stone dwelling, an 18th- or 19th-century hafod, longhuts, folds, a longhouse group, and earthworks. There are also some post-medieval quarries. 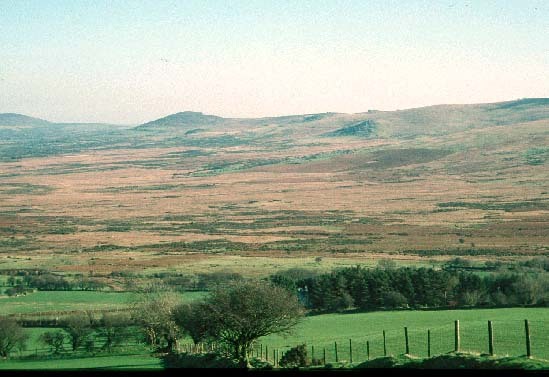 Mynydd Preseli is a very distinctive historic landscape character area. Its defining characteristic is its open nature. This is in sharp contrast with the surrounding enclosed and settled farmland. Sources: Bradley 2000; Charles 1992; Howells 1977; Meline tithe map and apportionment, 1841; Monachlogddu tithe map and apportionment, 1846; Mytum and Webster, 1989; Nevern tithe map and apportionment, 1843; Llanfair Nant Gwyn tithe map and apportionment, 1838; Sambrook 1997; Thorpe et al 1991; Whitchurch tithe map and apportionment, 1841.